I attribute my own particular attraction to this show when my age came in single digits. At that point, most shows were in color but still watching the black and white ones wasn’t unusual or weird. TZ didn’t make sense and that was fine by me. Later, in college, my friends and I stayed up well past midnight to catch episodes and quasi-pretend to be surprised (impossible, since the show was fodder for our misspent youths) or comment on the double meaning of the episode (“To Serve Man”). Even now, during marathon showings, I manage to sneak in a little quality TZ time and hope to catch one of my favorite episodes. After my Mom passed, inevitably we had to sort through her drawers. That’s never easy. Personal belongings are an assessment of one’s life; items chosen by Mom had purpose and meaning. A favorite scarf, her mother’s wedding ring, photos of people I’ll never meet whose names are lost to time – all jammed without mercy in her vanity top drawer. Major natural disasters wouldn’t have budged the contents. Mom kept all her accumulated possessions bound together like old friends who see no reason to part company. One afternoon, I chose the unwieldy task of sifting through her clown car dresser. I say this because I marveled at the amount of stuff she shoved into it. The more I grabbed at old clothes, hats, papers, candles, etc., the more intrigued I became. So tightly packed had everything become, items towards the back refused to relinquish the turf they so jealously guarded over time. Nearly emptying the bottom shelf, I came across a cardboard box, slightly smashed and held together with an ancient rubber band. Since I had no clue what was inside, I opened it. Within the box rested a collection of miniature masterpieces, lithos of relatively unknown artists combined with a few superstars. I shuffled through them, saw the obligatory Van Gogh “Sunflowers” plus a few other Greatest Hits. And there it was: Pig Girl. Glancing at me, her brown eyes hinted at nonchalance. 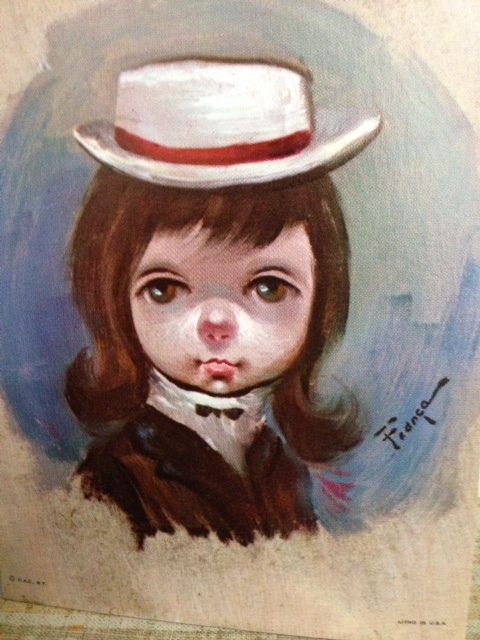 Pig Girl appeared as a young woman, possibly a teenager, with a round face and pug nose, sassy upturned brown hair, charming white hat, her collar tied with a bow tie that seemed to float in a sea of crisp whiteness. She wore a brown outfit suggesting a school uniform. 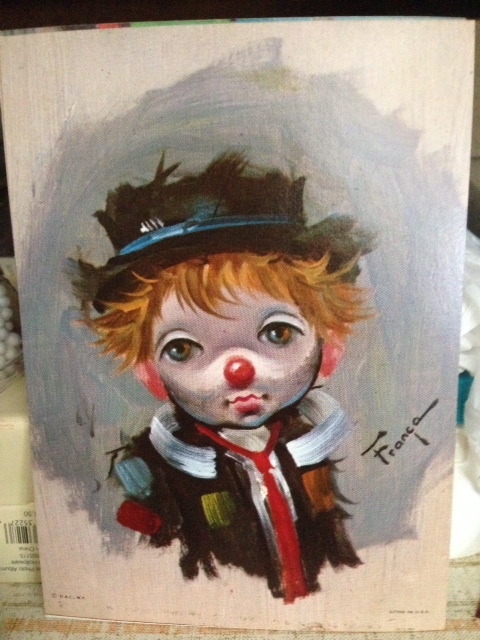 Hobo-clown, sporting a look of resignation on his face, seems determined to find a purpose despite his genetic mutation. Both he and Piggity survived the DNA splicing of human and pig, they planned to make the best of it and damned be the world. Can you imagine what might come next if these two produce an offspring? What horrors might come of that? I closed the box and its unsettling contents rested once more in their dark shelter. I must admit, their presence haunts me still. Strangely, I can’t find Piggity. She seems to have vanished. Kind of scary, don’t you think? So here’s a word of warning: when a parent dies, use extreme caution going through their former possessions. It can be a real trip through…The Twilight Zone. I absolutely love “The Twilight Zone”. We had a British Version of the show back in the 1970’s and 80’s called “Tales of The Unexpected”. I would force my younger sister to watch it with me and she’d end up having nightmares every night. She still reminds me of this every time I see her. Some people won’t let go, will they? I can only imagine if Rod Serling were alive today what TZ would look like. As it was, he was so far ahead of his time with his show.